I urge you teens, do not teach tigers to dab. We’re used to Logan Paul videos showing us something deeply disturbing, but we’re not used to that disturbing thing facilitating justice. Usually just inspiring a weird conversation on the horrors our children are witnessing daily on YouTube (that hyperlink is to a story about how he tased a rat!). However, a Logan Paul video helped rescue a tiger cub after the police discovered a man was abusing a tiger cub in the place where all disturbing sights naturally must convene: one of Logan Paul’s videos. 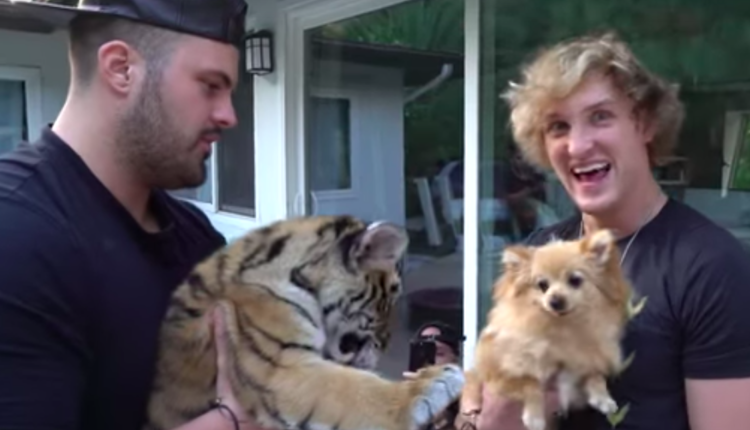 The video, “KONG MEETS A BABY TIGER **Showdown**”, showed Logan Paul’s pomeranian, Kong, playing with the tiger owned as owned by one Nicholas Perkins. And look, some advice to Nicholas, if you’re going to insist on owning illegal wildlife, maybe don’t bring it on a YouTube channel synonymous with unlikely popularity. The video of the two animals not killing each other, uploaded in September, 2017, is currently sitting at eight million views, and one of those eight million people sent a tip to the California Department of Fish and Wildlife. The other 7,999,999… I don’t know what you’re about. When the California Department of Fish and Wildlife moved in on Nicholas, they found was a tiger abused and malnourished, being fed formula for kittens rather than the food proper for its species. They have since removed the tiger and pressed charges against Nicholas. 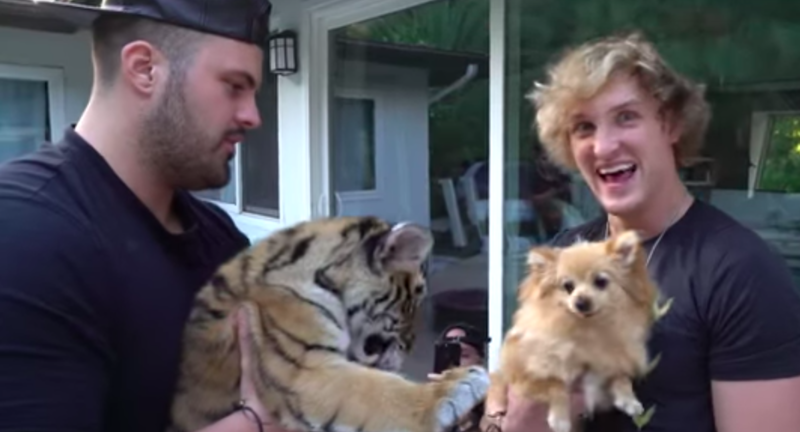 Logan Paul’s life so far has involved bouncing from the Japanese Suicide Forest, tasing rats, and now forcing his dog to play with a malnourished tiger cub. Being a YouTuber looks exhausting, but I’m sure it will make a great and very stressful biography someday. Los Angeles City Attorney, Mike Feuer said, as quoted in the LA Times: “Tigers and other exotic animals are not pets. Keeping these potentially dangerous animals in a residential setting poses a serious safety risk for residents and animals alike.” So if you want to own an exotic animal, Mike Feuer doesn’t think you should. What do you think of this story? Would you drink kitten formula? Let us know in the comments or on Twitter at @WhatsTrending.